Detached Family Home with Six Double Beds, Three Receptions Rooms, Two En-Suites, Two Kitchens (this Includes a COMPLETELY SELF CONTAINED ANNEX). 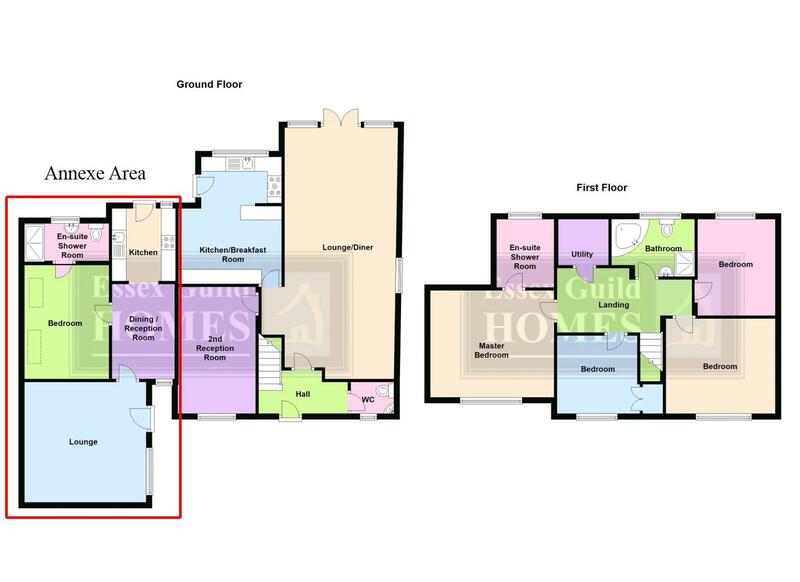 Total Floor space of OVER 2,000 sq ft of Accommodation. Quiet SOUGHT AFTER cul-de-sac Location. Parking for Two-Three. Fitzwimarc Schools Catchment. Double glazed security entrance door to front, textured and coved ceiling, neutral painted walls, neutral coloured carpet, double radiator, stairs lead to first floor, ceiling light point, power points. Double glazed leaded window to front, textured and coved ceiling, fully tiled walls in neutral coloured ceramics, two piece suite in white comprises dual flush low-level w.c., wash hand basin inset with chrome mixer tap and cupboard below, tiled floor, shaver point, radiator. Double glazed window to side, textured and coved ceiling, papered walls, brick-built feature fireplace with side shelf units and brick-built hearth, radiator, various power points, wall light points, television point, open to dining area. Double glazed French doors to rear, textured and coved ceiling, papered walls, wall light points, double radiator, wood laminate flooring. Double glazed bay window to front, textured and coved ceiling, papered walls, double radiator, ceiling light point, wood laminate flooring, various power points. Private Door to Annexe. Double glazed door to side, double glazed window to rear, textured and coved ceiling, fully tiled walls in neutral coloured ceramics, Rangemaster “Toledo” cooker with multi-burner facility, various ovens and grill, complementing extractor hood/fan above, one-and-a-half bowl stainless steel double sink unit with single drainer and chrome mixer tap, integrated dishwasher, built-in fridge/freezer, range of units at both base and eye level in light colours with brushed steel fitments, breakfast bar area with seating for four people, complementing floor tiles, radiator. Textured and coved ceiling, papered walls, carpeted, loft access with pull down ladder (the loft is partially boarded and has lighting). Double glazed window to front, textured and coved ceiling, papered walls, wood laminate flooring, radiator, television point, various power points, door to en-suite. White double glazed window to rear, smooth plastered and coved ceiling, fully-tiled walls in neutral coloured ceramics, lino flooring, tiled shower cubicle with double opening doors and matching side panel, inset chrome shower with flexible hose attachment, dual flush low-level w.c., feature circular hand basin with chrome mixer tap inset to shelf with cupboards built in below, white heated towel radiator. White double glazed window to front, textured and coved ceiling, ceiling light point, smooth plastered walls, built-in wardrobes, recessed alcove for bed, wood laminate flooring, radiator, various power points. Textured coved ceiling, papered walls, built in wardrobe, radiator, various power points, television point, neutral coloured carpet. White double glazed window to rear, textured and coved ceiling, papered walls, radiator, various power points, wood laminate flooring. White double glazed window to rear, smooth plastered and coved ceiling, fully tiled walls in neutral coloured ceramics, large feature corner bath unit with multi jet system, chrome mixer tap, low level w.c., wash hand basin with vanity unit below and chrome mixer tap, separate tiled shower cubicle, glazed folding entry door and matching side panel, wall mounted Triton electric shower, radiator, vinyl flooring. Neutral painted ceiling and walls, ceiling light point, various power points, space for two domestic appliances with plumbing, wall-mounted boiler serving hot water and central heating systems to the main house (separate heating system to the annexe), power points. Private door to front and double glazed window to front, textured and coved ceiling, smooth plastered walls papered to one wall, two radiators, various power points, television point. Full height leaded double glazed window to front, textured and coved ceiling, papered walls, radiator, power point. Double glazed window and door to rear, textured ceiling, fully tiled walls, range of fitted units at both base and eye level, four ring ceramic hob with extractor fan above and built-in fan oven below, space beneath work surface for domestic appliance, further space for upright fridge/freezer, one and a half bowl stainless steel sink unit with chrome mixer tap, roll top work surface, tiled flooring, lighting. Two small lantern style ceiling windows, textured and coved ceiling, smooth plastered walls, wall light points, radiator, power points, carpeted, door to en-suite. Double glazed window to rear, textured and coved ceiling, fully tiled walls, wall mounted boiler serves heating system for the annexe, low-level w.c., wash hand basin with chrome taps inset to vanity unit with cupboard below, shower area with disabled access, folding doors and shower rail, carpeted. Paved stone area, established L Shaped bed with shrubs, bushes and trees, seating area, outside lighting. Paved Drive allowing parking area for 3 vehicles.